Rhenishers celebrated their time together and old friendships as they reunited in the Hostel dining room for the annual Luncheon and AGM. 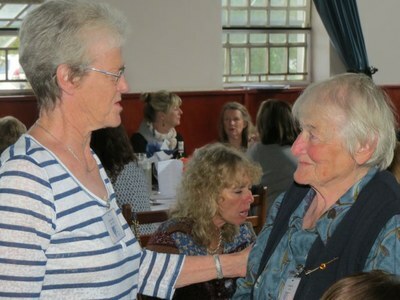 Old girls - some celebrating their first reunion and others their sixtieth reunion - chatted loudly over a lovely meal and shared delightful stories of their time at Rhenish Girls' High. Whether they were here in the 50s, the 60s, the 70s or in 2016, the things that remain the same are the things that bind Rhenishers to this day - our values: integrity, compassion, excellence, accountability, diversity and respect. And, of course, a love of good food! The dining hall reverberated with laughter as the shared memories that make a family were recounted, news of friends was shared and voice was given to the motto, "Once a Rhenisher, Always a Rhenisher".